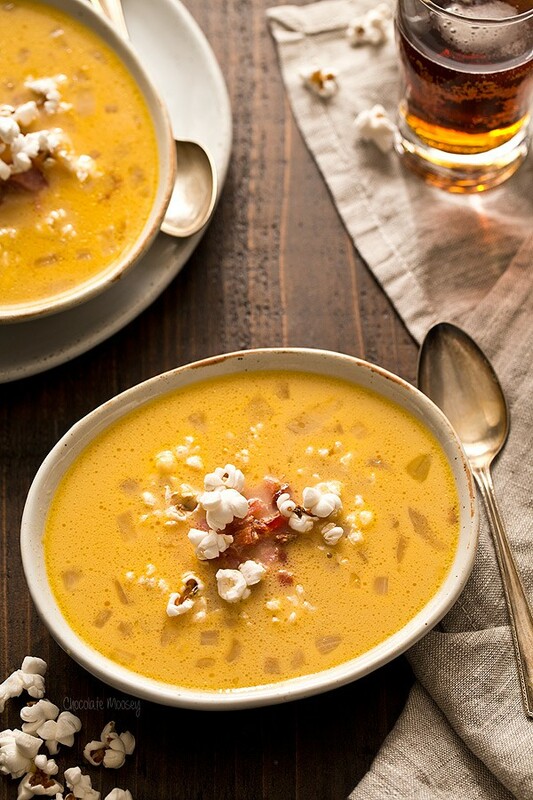 Every day is a great day to make soup for dinner when it’s Bacon Beer Cheese Soup with Popcorn. 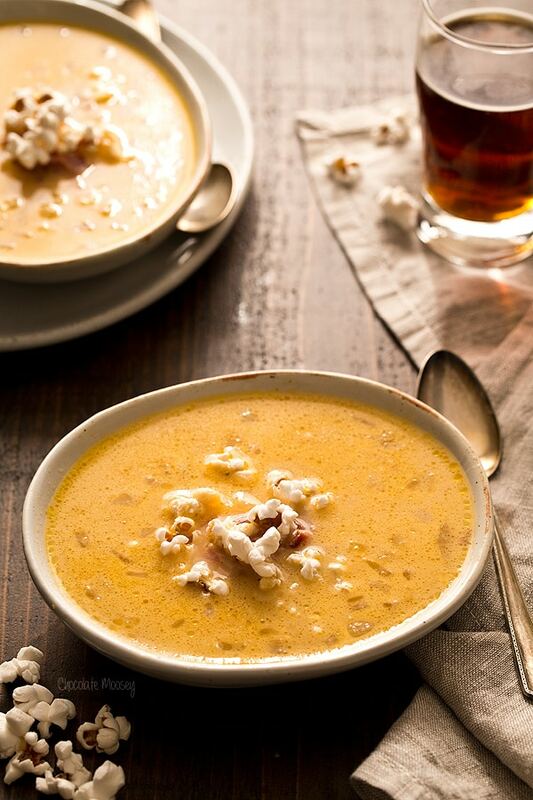 You’ll probably looking at the title going, you made Bacon Beer Cheese Soup with popcorn while you were sick? No. As tempting as it was, I made it before I got sick. I’m certainly not recommending eating this when you’re sick (I’m pretty sure this is the opposite of chicken noodle soup), but when you have your taste buds back, you’ll want to make this for dinner or even breakfast. Yes, I said breakfast. Did you know back in medieval times, beer soup was served for breakfast? Seriously, why isn’t this a thing nowadays? Can we make this the next food trend? Would I get crazy looks at a restaurant if I ordered it for breakfast? Especially because this recipe has bacon in it. Until this starts becoming more socially acceptable, I think I’ll start eating this bacon beer cheese soup for breakfast in the comfort of my own kitchen. Because I had to buy a six-pack of beer for my Mexican beer cheese dip, I had several bottles leftover. In addition to just drinking them, I really wanted to make beer cheese soup. I had beer cheese soup a few years ago at a brewery on vacation that was made with gorgonzola cheese. 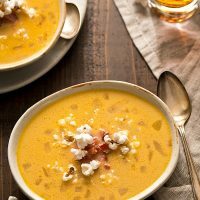 My soup recipe uses cheddar cheese, although you can certainly mix it up with whatever cheese you have in your fridge. 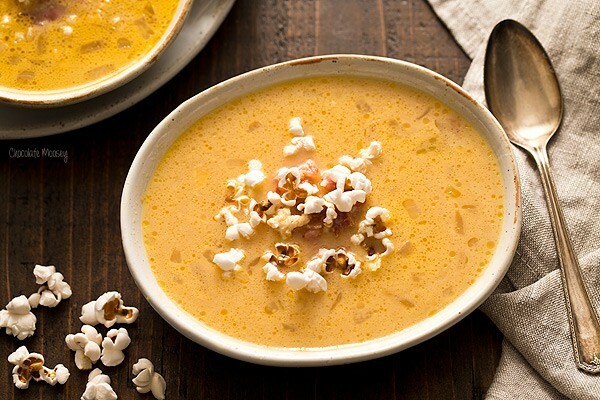 Adding popcorn to cheese soup may sound a little strange, but it adds texture and salt (assuming you’re using salted popcorn). I bet it would taste even better with my chili cheese popcorn. Because the popcorn dissolves quickly, you need to add it as you’re eating. Assuming you haven’t been snacking on said popcorn while the soup is cooking. Oops. Add bacon to a large pot or Dutch oven and turn the heat on to medium. Once the bacon starts cooking, cook on one side for a few minutes until crispy then flip and finish cooking the other side. Remove the bacon and place on a plate lined with a paper towel; pat off as much grease as you can. When cool enough to handle, crumble bacon. Leave the bacon drippings in the pot. Add the onion to the bacon drippings and cook until soft, stirring often, about 5-8 minutes. Stir in the flour, coating the onions. Gradually stir in the broth and beer. Bring to a boil, stirring often. Once boiling, cook for 5-10 minutes until the broth starts to thicken slightly. Add the milk, cheese, Worcestershire sauce, and crumbled bacon. Stir until the cheese melts. Taste with a piece of popcorn and add salt if necessary. Serve with popcorn on top. *I can't give a specific amount of salt as it'll depend on your broth, bacon, and popcorn. Once the soup comes together, taste it with a piece of popcorn. If it needs more salt, add it in 1/4 teaspoon increments. I cook for one. It would be helpful to know if a dish freezes well, so I could make the whole thing. This soup sounds wonderful! I’ll wait until cooler weather to make it, though. Hope you have a wonderful birthday!!! !